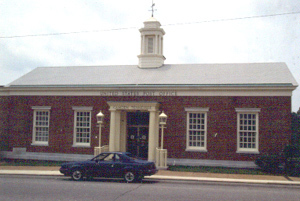 The United States Post Office in Camden is a Colonial Revival style structure built in 1938. It features a mural done by the Works Progress Administration as is listed on the National Register. The Tennessee General Assembly created Benton County on December 19, 1835, from portions of Humphreys and Henry Counties. Officials organized the county in February 1836 in a small log cabin at the site of a local post office in what is now West Camden. Initially, the county name honored Thomas Hart Benton, a leading Jacksonian Democrat, but in 1852 the state legislature approved an act that retained the original name but honored “David Benton, an old and respected citizen” of the county. The county lies partially in the western valley of the Tennessee River and partially in the plateau of West Tennessee. Its eastern boundary is the Tennessee River, whose shoreline includes a part of Kentucky Lake. The northernmost section of the county is hilly, with deep, broad valleys; numerous steep bluffs overlook the river. Near the village of Eva is Pilot Knob, one of the highest elevations in West Tennessee at some 650 feet above sea level. Otherwise the county is topographically rolling and heavily forested. The county has a considerable prehistory; at the time of its first settlement by blacks and whites, the Chickasaws claimed the area as a hunting range and maintained a few scattered habitations. Following the Jackson Purchase, settlers from Virginia, the Carolinas, and other eastern states arrived. Black settlers generally came as bondsmen of the whites, although several free blacks lived in the county during the antebellum period. Benton County remains essentially a rural entity with several small towns and villages. Named for Camden, South Carolina, the site of a Revolutionary War battle, the county seat of Camden was established in 1836 on the high ground above Cane Creek, a tributary of the Tennessee River. The courthouse occupies the center of the public square, though in recent years businesses have moved to the west and northwest sections of the town. Benton County’s first banking institution, the Camden Bank and Trust Company, opened in 1889. Benton County supports two radio stations and an airport, and Camden has several churches, factories, and financial institutions. U.S. Highway 70 and U.S. 641 provide transportation links for Camden and Benton County. Located twenty miles south of the town, Interstate 40 can be reached via U.S. 641. Big Sandy, named for the river on which it borders, owes its existence to local railroad development from about 1860. Its present incorporation dates from 1903. This prosperous rural town enjoyed considerable growth from the area’s extensive tourism. Within a radius of forty miles, there are thirty-five resorts, restaurants, and boat docks. Eva, a village named for Eva Steele, was originally known as Bartlett’s Switch and began as a result of railroad development. Eva faces Kentucky Lake and provides a small river craft landing and a park. These attractions, along with the town’s proximity to Nathan B. Forrest State Historical Area and to Lakeshore, the United Methodist campground, make it attractive to tourists and local citizens. Locked in the hills of northern Benton County, the village of Faxon was established in 1881 and named for its postmaster, George B. Faxon. It is located on the Bass Bay Road, seven miles east of Big Sandy; several fishing facilities are located nearby. Holladay, a village fifteen miles south of Camden in the rolling landscape of Birdsong Valley, began as a small settlement in the 1840s but had its firm beginning in 1887 with the establishment of a post office honoring the village’s principal merchant, John M. Holladay. One of the county’s most notable schools, the Holladay Independent Normal, operated there. Principal county loyalty rested with the Confederacy during the Civil War, although a firm, but subdued Unionist element existed in the county. Troops under General Nathan Bedford Forrest destroyed the large supply depot at Johnsonville, across the river from Pilot Knob, in November 1864 in a notable engagement. In the 1930s the Civilian Conservation Corps expanded upon an earlier local historic park at Pilot Knob to create the Nathan B. Forrest State Park. Tennessee took a leading role among the southern states in the passage of woman suffrage when the state legislature enacted a limited suffrage bill on April 17, 1919. Five days later, Mary Cordelia Beasley-Hudson of Benton County cast the first female ballot in the state in the Camden municipal election. Politically the county has been overwhelmingly Democratic throughout its history. It was the birthplace of Thomas C. Rye, governor of Tennessee, 1914-18. The Tennessee Valley Authority (TVA) changed the eastern landscape of the county and improved cultural life. The TVA attracted a small, but consistent, industrial development and boosted the local economy. Electrical power is distributed by the Benton County Board of Public Utilities in Camden. Benton County has always had a strong religious commitment. The earliest congregation organized the Cypress Creek Baptist Church in November 1821. County denominations include Baptist, United Methodist, Church of Christ, Pentecostal, and Roman Catholic. The Camden Chronicle, established in 1890, embodies the best local newspaper traditions, reporting county events and boosting economic development. The Benton County Library organized in 1942. Led for three decades by Ruth Priestley Lockhart, the library developed into one of the foremost small libraries in the state. The Benton County Genealogical Society, chartered in July 1986, has been active in the preservation of the county’s heritage and its public and private records. The county is well served by a general hospital in Camden and several medical practitioners. Its 2000 population was 16,537.